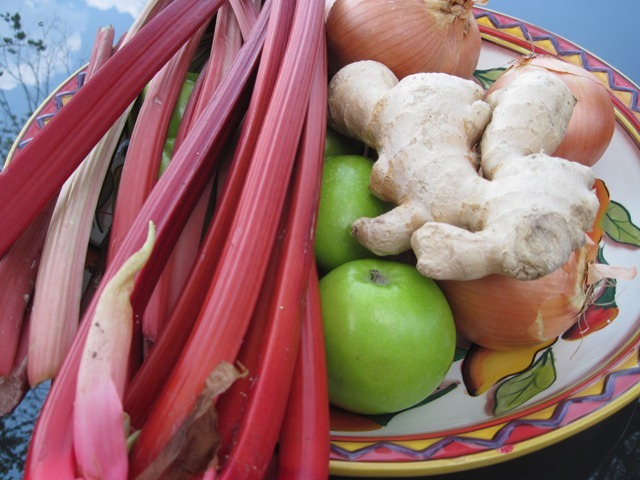 Chutney can be made from any over achieving fruit such as rhubarb. The beauty of chutney is you can be truly creative. You can go beyond the basic recipes and put your inspiration into your own recipe. There is only one problem – keeping track of what goes into your chutney. I have made some truly lovely recipes over the years but have been unable to recreate them as I was a little less than diligent in keeping track of what spice combinations I added. However, the joy is in the making of the chutney and creating something truly unique. There is no definitive chutney – just wonderful and creative condiments made by the likes of you and me. I enjoy making chutney with ingredients on hand. Last year I dried the virtually seedless coronation grape and, having several bags on hand, I wanted to use them up. I also had the trio of fresh ginger, candied ginger and ground ginger. Chutney made in the “new” world is typically very different from chutney made in India. Indian chutney is generally made from fresh ingredients – not preserved as Western chutney. However, Western style chutney is delicious in its own right. Served simply with cheese or as an addition to cold meats, curried dishes, or on a sandwich it can be a wonderfully exotic condiment. Chutney needs to age and mellow to reach its full potential. It is best left for at least a month before using. Don’t use your chutney too soon. The flavours need to develop. In the recipe that follows, I am not giving any details on how to preserve. There are many good resources out there that can do a much better job of explaining than I can. As mentioned, I used dried coronation grapes. You can use white grapes if you like. The coronation grape is a vibrant blue/purple grape which will impart its colour to your chutney. A lighter grape will make a lighter chutney. 1. 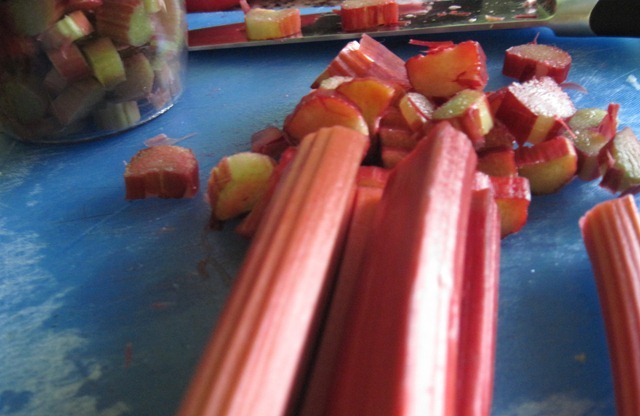 Trim rhubarb and cut into 1/2 inch pieces. 2. 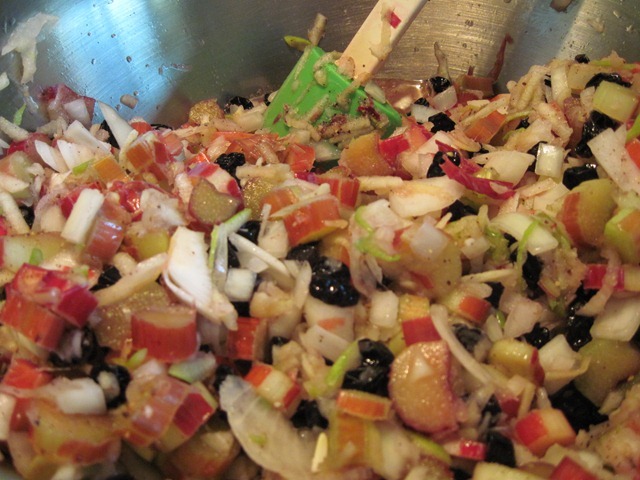 Peel and core apples and grind them with the raisins and onions the fine blade of a food processor. Alternately, chop finely. 3. 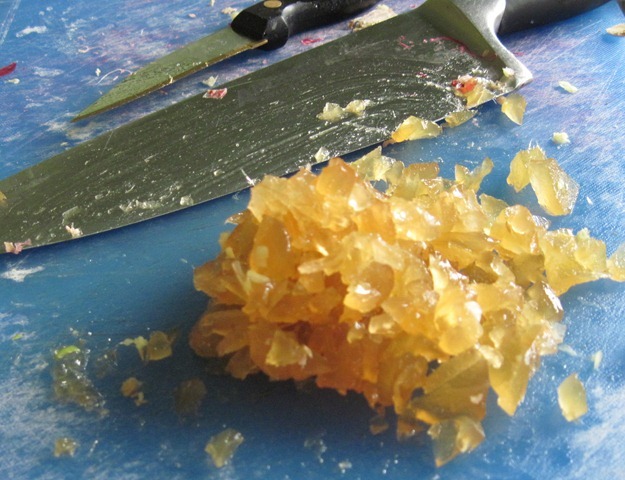 Chop finely the candied ginger. 3. Mix all ingredients together in a large kettle and simmer gently for 2 hours or until thick. Pay attention! Chutney burns as it thickens. Give it a stir occasionally. 4. 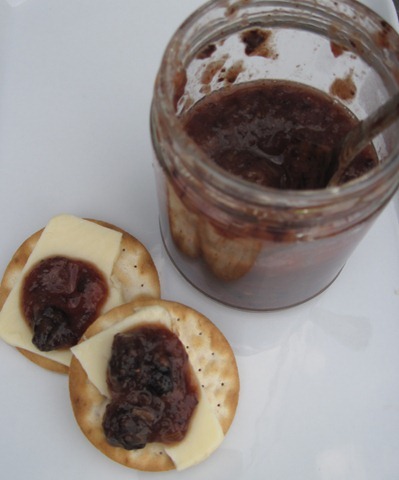 Pour hot chutney into jars, seal and process. 5. Let rest for at least one month before using. What you accomplish with the recipes I share with you is what makes me eager to share more. Thank you for following. I’ve never heard of a mushroom seed! Where do you get them and how crucial are they to this recipe? 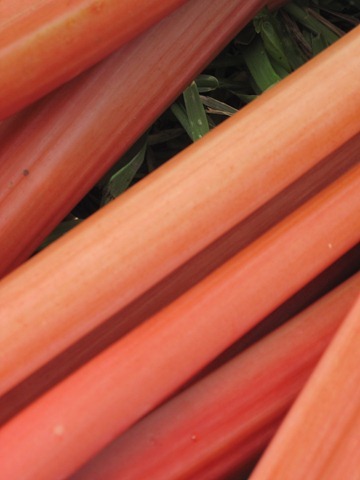 I’m sending your rhubarb recipes to friends who have lots of rhubarb.